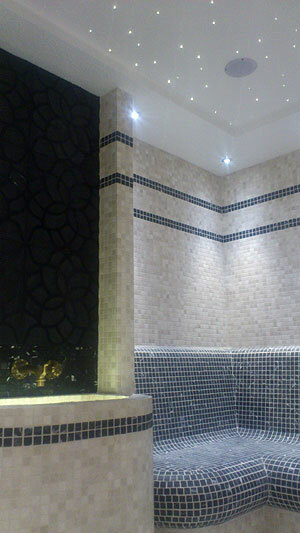 We’ve been designing and installing a lot of Hammam Tiled Steam Rooms lately. This latest one started off with an initial meeting David Hales Interior Design. We were brought in to discuss a bespoke hammam steam room which would be constructed in a client’s home in Knightsbridge, Central London. David Hales were very impressed with our experience as a company. 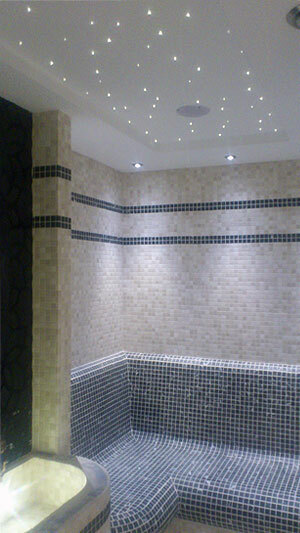 The client was very specific about the tiled steam room being as authentic as possible and the finished room had to be presented as a hammam rather than just another bespoke steam room installation. We took the design from David Hales and embellished it with Leisurequip’s hammam knowledge bank. This ensured the interior would be a first class, authentic presentation. During the design process we removed the shower as there was already showering facilities within the bathroom but added a tiled hammam sink. We advised on more than the just the Tiled Steam Room. Leisurequip also advised on the layout of the luxury bathroom to maximize the steam bathing experience. The stone and black marble tiled design by David Hales has a double band of inset black marble tiles around the top of the walls. The black marble tiles are also on the benches which are heated electrically so the room can double up as caldarium hot room as well. The traditional Tiled Steam Room sink installation is the central feature and is to be crowned by a Cosmos black granite vanity stone counter top. The counter top is being manufactured by bespoke stone specialists Surrey Marble and Granite. Brought in specifically for this bespoke tiled hammam are two traditional hand-cast brass taps and an ornamental brass spout which emerges from the Indian handmade black tiled splash back. The specialist painted ceiling has a raised coffer with inset white twinkling starry sky with the flat perimeter having 1 to 10 dimmable LED down-lights. Even the tiled hammam sink has a pair of underwater LEDs to make the water sparkle. Ventilation to the tiled steam room is chilled air blown in rather than extracted to keep the steam production continuous. The entrance is a bespoke frameless glass door which was installed by ion glass and has an etched finish on the outside for privacy and satin bar handles. This impressive and probably one of the best hammam tiled steam room installations in the UK is also powered by a Tylo steam room generator 12VA and H1 controller, which of course is our first choice as Leisurequip is Tylo’s UK approved dealer installer.